WASHINGTON — The sweeping tax reform measure passed by Republican lawmakers this week includes few items specific to service members, but significant repercussions for military families in years to come. At the least, troops will see a host of new tax brackets and rules when they file taxes next year. The tax reform package drops rates for most taxpayers who make more than $10,000 annually, and supporters estimate that about three-quarters of Americans would get a tax cut under the plan. Kelly Hruska, government relations director for the National Military Family Association, said most of the issues she has seen with the tax changes involve changes in child tax credits, income rate changes and state tax issues — items that affect all taxpayers, not military members specifically. Earlier drafts included some troublesome spots for military-specific issues, like moving expenses and uniform costs, “But it looks as if a lot of those things have been addressed now,” she said. Individuals in the lowest tax brackets will see the least benefit from the new tax plan, but that doesn’t mean they won’t see any benefits at all. For single filers making between $9,526 and $38,700, that means a shift from a 15 percent bracket to a 12 percent one, boosting their take-home money. For this example, the sailor would see a savings of about $500 a year. But that can vary wildly depending on a service member’s circumstances. That $500 calculation assumes the sailor doesn’t have more than $10,000 in deductions — things like charitable contributions, uncovered medical expenses or mortgage interest costs. Lawmakers raised the standard deduction for single filers from $6,500 to $12,000, but also reduced the amount of personal deductions in the reform bill. As a result, some individuals with more unusual financial situations will see their taxes rise slightly, as those exemptions disappear. In addition, Congress put a cap on state and local tax deductions of $10,000 annually. For states like California — which has one of the highest individual income state rates in the country — the cap could significantly add to troops’ taxable income. But that is unlikely to hit lower-ranking troops. 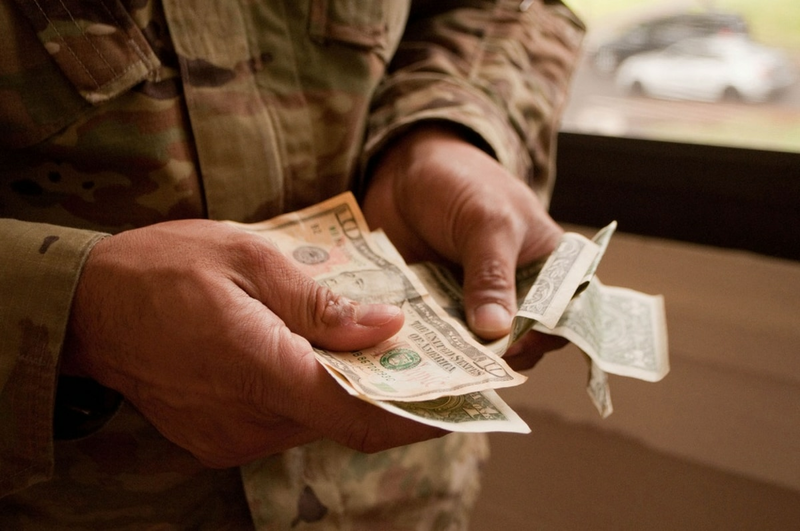 This soldier’s salary doesn’t include more than $17,000 in housing stipends over the course of the year, because those allowances aren’t taxable. And while the new tax reform bill does eliminate some deductions for moving expenses, the military was given an exemption, meaning those changes shouldn’t hit troops wallets. Assuming each spouse in this example earns roughly the same salary ($48,000 for the soldier alone in 2016), their family would end up in the third tax bracket, which drops from 28 percent to 22 percent under the new reform bill. The tax credit for children doubles to $2,000 per person, and the standard deduction for couples goes from $13,000 to $24,000. All those mean a significant boost in the family’s tax return under the new plan, somewhere in the range of around $3,000. Again, depending on how many deductions they lose under the plan, that refund could shrink. But the family is unlikely to pay more in taxes as a result of the changes. Lawmakers changed some of the rules for mortgage interest deductions in the tax reform plans, but also added an exemption for military families after advocates voiced concerns about frequent moves hurting troops who own a home. As a result, this Marine family should not see any changes in that aspect of its tax bill. This example uses only the Marine’s salary, assuming the spouse is a full-time caretaker for the child. Their income puts them squarely in the middle of the 12 percent tax bracket, and they’ll see the same benefits as the examples above from the standard deduction increases and the child tax credit boosts. Since Virginia has among the highest state tax rates in the country, they’re at higher risk of hitting that new $10,000 cap on deduction of local taxes, and could lose out on some previous savings. Still, the family is likely to see a tax refund increase around $1,500 under the new plan. Even with an income over $100,000 annually, the officer in this example still falls in the middle of seven tax brackets (the fifth bracket starts after $157,000 for single filers). Under the tax reform changes that drops from 28 percent to 24 percent. The new highest tax brackets — where income is hit at a 37 percent rate — start over $500,000 in yearly earnings. Because this example is a high-income single filer (and, without children, may have more unexempted financial investments than some married peers) the officer is more likely to run into the problem with eliminated deductions. They could swing the final tax bill by a few thousand dollars, depending on the specifics of what still can be claimed and what now becomes a new liability. Still, that range all falls on the side of more money for the taxpayer, somewhere between a few hundred dollars and more than $3,000.